Stephen Perloff is a photographer and art critic. He founded ThePhoto Review in 1976 and has been editor ever since. He also is the editor of The Photograph Collector. Perloff is best known for his landscape photos. 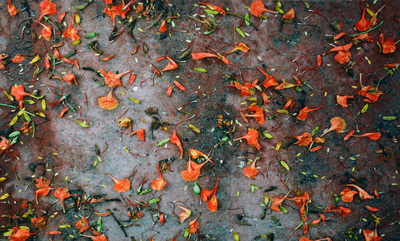 Flame Tree Leaves, Bangkok was photographed in Thailand and is from Perloff’s Unseen Color, Part II collection. The collection is a series of photographs shot from a trip taken in 1977 to East Asia and the western U.S. Although this image was captured in the East, it portrays a similarity to the changing of seasons in many places of the world. This work was acquired in 2016 while Perloff served as a visiting artist for the University of North Dakota.